"Stood up" Democratic presidential nominee the Rev. 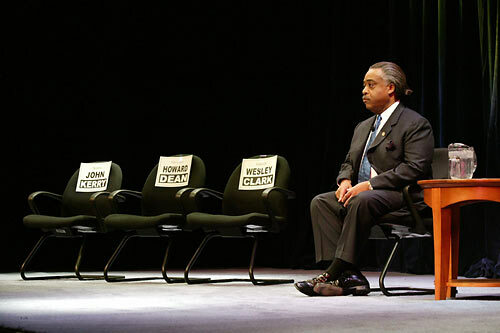 Al Sharpton appears alone at what should have been a debate during the Democratic caucus in Michigan at the Northwest Activites Center in Detroit, February 5, 2003. Although they had all confirmed to appear, U.S. Sen. John Kerry, former Gov. Howard Dean, and Ret. Gen. Wesley Clark all cancelled shortly before the event.